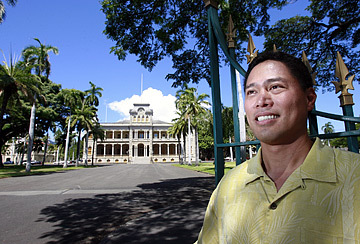 Kippen de Alba Chu has been named executive director of Iolani Palace. He is both a former chief of staff for state Rep. Bertha Kawakami and assistant executive director of Hawaii Insurers Council. Question: There was an hour-long confrontation at the palace a week ago between statehood celebrators and native Hawaiians protesting how the celebration was being held on the palace grounds. How is it determined who can hold events there? Answer: That is determined by the state Department of Land and Natural Resources. They issue the permit. We have no say in that. I believe that we should be consulted very closely, especially on sensitive issues like this one. » New job: Executive director of the Iolani Palace. He succeeds Deborah Dunne, who left at the beginning of February. » Background: He most recently worked as assistant executive director of the Hawaii Insurers Council, starting in 2004. Before that, he worked for 13 years as office manager and chief of staff for state Rep. Bertha Kawakami (D, Niihau-Poipu-Kokee), his auntie. He was born and raised in Hawaii and studied international business administration. Q: Will you meet with the state? A: We're actually going to meet with them. We're going to set up a meeting with the chairman of DLNR and the governor and top officials to come up with a better policy for future events. Q: What brought you from studying international business administration to working at the state Legislature? A: After I got my degree I actually wanted to come home to Hawaii. I missed the surf and I had been away for five years. I worked for my auntie, Bertha Kawakami. I got interested in listening to her talk about the legislative session. Q: How did your experience at the Legislature compare with your expectations? A: It was a lot harder than I thought it would be. There was a lot of work involved, a lot of research, a lot of overtime. Very different from the stereotype people have. Q: It wasn't a 9-to-5 job? A: That's what I liked about it, the different hours, and also to see things from a different perspective. Q: A press release said the palace is facing challenging new times. How so? A: We do not have a dedicated source of state funding and that's one of our top priorities. Our funding has been private, and we also recently got a grant-in-aid from the state for $600,000 -- but that's a one-time for operations. Q: How much private funding do you get? A: The most recent year, privately we brought in $400,000. Q: What does it cost to maintain the palace? A: We have about $1.5 million in operating expenses annually. Q: Are you seeking more private funding? A: We're going to push for more private grants from local foundations and from foundations on the mainland as well. We don't even have a development director at this point. Any grant would be great at this point. Q: What's the palace's financial state? A: The state's grant-in-aid is going to pay for our electricity bill and security. Another top priority is replacing the air-conditioning system in the palace. It keeps breaking and it's very energy inefficient.